Bombs struck the Brussels airport and one of the city's metro stations Tuesday, killing at least 34 people and wounding dozens, as a European capital was again locked down amid heightened security threats. Below are the latest details of what happened, with information about Belgium and the New York City-area's response to the attacks. 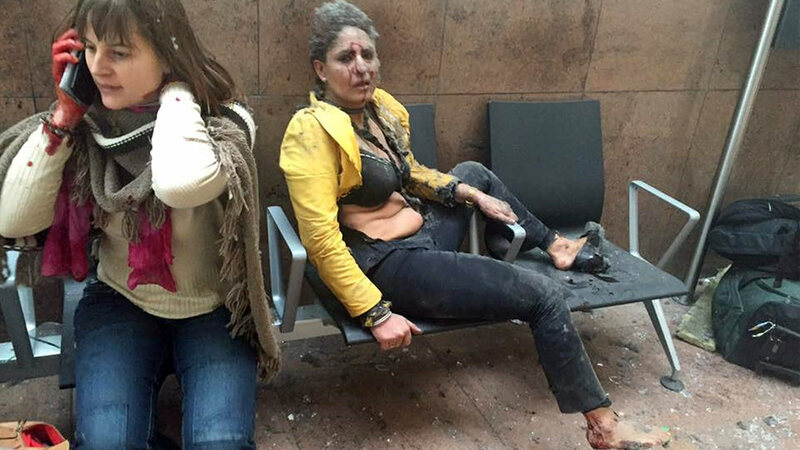 - At least 34 people were killed in two bombing attacks, ABC News reports - one at the Brussels airport and the other in a subway station. - European security officials have been bracing for a major attack for weeks, and warned that the Islamic State group was actively preparing to strike. - Late Tuesday morning, ISIS claimed responsibility for the attacks. - A total of 10 Americans have been injured in the attacks, including 1 U.S. service member, his 5 family members, and 3 American missionaries. - Two blasts were heard at the Brussels airport, one of which is being blamed on a suicide bomber. - Brussels Zaventen Airport CEO told ABC News there was a third bomb at the airport which did not explode. It was neutralized by the police. - A spokeswoman at the Belgian federal police confirms to ABC News that a surveillance photo shows the possible suspects from this attack. See it here. - The explosion happened at 9:11 a.m. (Brussels local time) in a train that had five cars. The blast went off just as the train was leaving the station, officials tell ABC News. The bomb went off in the second car, which was still on the platform. - Security in New York City and the entire region has been beefed up after the attacks. - "The New York City Police Department is closely monitoring the situation in Belgium and is in close contact with our international partners and with the FBI," the NYPD said in a statement. - NYPD is deploying addition counterterrorism units to crowded areas and transit stations. - More than 200 flights to Brussels have been diverted or canceled after three explosions that authorities are calling terror attacks. - World monuments including 1 World Trade Center in New York, the Eiffel Tower in Paris, the Burj Khalifa in Dubai/UAE, the Brandenburg Gate in Berlin and others will be lit up in the black, yellow, and red of the Belgian flag tonight as an homage to Brussels. Eyewitness News reporter A.J. Ross is traveling to Brussels and report live from there later in the day. We're continuing to follow this story very closely. Keep checking abc7NY for the latest information.